My Aunt Katie Kelly came home from America in 1929. She was there from 1904. She was long enough in it, I think. She had buried her sister Ellie and she had buried Michael who was gassed in the War when she was in America. Tommy died in it – Tommy and Michael and Ellie. And then there was Bill and Mrs O’Toole and she died in America. Katie came home then. Her sister Winnie had gone into the nuns, Sister Justin, up in Belfast or Hammersmith, or someplace. Katie took in her two nieces, my sister Delia and I, at a young age. She sent us to school and kept us there. Katie was great. She reared Delia and I and she had nothin’. I often think of it. Who’d take my children and rear them? What they tell me now is that she wouldn’t let us back to our parents. My father and mother used come to Mass every Sunday during the War in the pony and trap and bring us to Mass – Katie, Delia and I and whoever else he’d bring with him. He had a car when he got married to my mother but when the War started, no petrol. When the War was over he got another car, a Prefect. And we wanted to go home then. My mother would come in and do the shopping and my father would be there waiting for her and we’d want to go up home. We always called it home although we didn’t live in it. When Katie came home she bought the house and she set up as a dressmaker. After awhile she set up a small shop and I helped her to run the shop. We used have cows and calves. We only had three acres of land but we still had a cow and a couple of calves. We also had turkeys and pigs and we made a few pound that way, that and the bit of dressmaking. Oh, there was everything in the shop. Up on a shelf was jars – I see on television these days talking about those jars of sweets, the big high jars of sweets. There was every kind of a sweet in those jars. The children used come back from Liscune and they’d be in, in the evening, for the lollipops and Peggy’s Leg, and the Bull’s Eyes, and a Penny Bar. 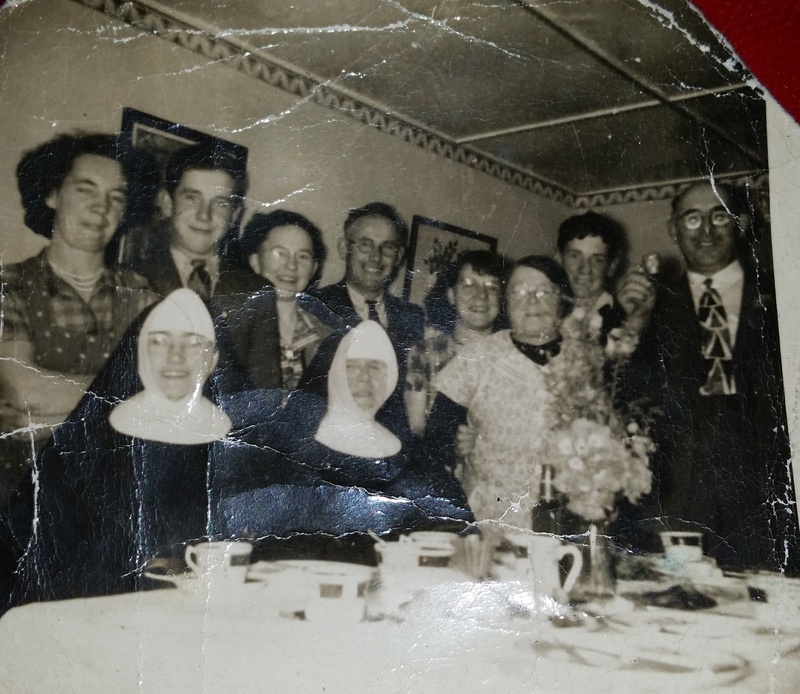 We were down at Mass in Ballymacward one time when there was a mission and when we came home, the Murphy’s in Loughrea were putting in a fridge. And that was the first time we saw ice cream. Oh there was great excitement then. Katie got in ice lollies. There used be a crowd at the turn every Saturday and Sunday evening playing pitch and toss and they’d be running up the road, coming up for their lollipops. The bag of sugar would come in on the CIE lorry and the flour. The flour would come down in a big bag. You had to weigh everything: weigh the sugar, tea, flour and raisins. Katie used have meat – ‘twas mainly bacon, I suppose. The bacon was a slab. You wouldn’t get much in it at times. The ham – she had a slicer, a small slicer. Poor Mrs Ryan got it afterwards. You’d twist the handle and the slice of the ham would come out. Donnellys came every Thursday or Friday with sausages. And Duffys from Loughrea and Hopes with the bread. What do you call her from Ahascragh? Twibbles. She brought bread and buns and cakes. I can’t understand, when I think of it. Katie had a big drum of paraffin oil in the corner of the shop and when you wanted a gallon of oil, pump it up. Even with all the rest of the things in the shop, there was no notice passed, nothing about health and safety that time. We wanted to go home but Katie wasn’t inclined to let us. She was afraid something would happen to us where there’d be three or four other boys around. At that time the children were tied down a lot. We were tied down. We couldn’t go down to a dance in Woodlawn ‘til we were eighteen. They’re going now at twelve. There was none of that in my time. If you looked out the door, down at the turn after a fella, you wouldn’t be long being called. I remember one fella there. He heard many a call. Delia went home for a few years up to Woodlawn and she got married in 1954. I got married from Katie’s place. My husband Tom came up from Castlefrench. I was twenty-five when we got married. We had eight children. Gerry was born in ’59, in July. Niamh was born in ’61, Justin in ’63, Frances in ’64, Noreen in ’67, Seamus in ’69, Maureen in ’71, and Declan ’74. I closed the shop when Katie died. I couldn’t be doing outside work and inside work. Tom was gone to work with the County Council. He worked first with Lord French where he was head over five or six men. That was in Castlefrench. French had a big job going on but he lost money in it. Next thing he died. So Tom then got into the County Council and he stayed with them. He was gone to work every day. I had the three acres. Then there was land going and the land was divided. ‘Twas very quare, wasn’t it? Ah, we managed. Tom went out working. When Katie bought this house, she got that house and this field down here. It was a private sale – I don’t know what you call it but you were supposed to get no land with it then. She got three acres anyway. When Tom wanted hay or anything – we had cows – and when he wanted hay he’d go out and buy a field, a meadow, and we’d save it. That’s how we fed the cattle. I built this house I’m living in now in 1979. There wasn’t enough room out there anyway for a family – they were well up, alright. The old house did us while we were in it. I’m quite content. They’re all gone. Yesterday now I had a houseful, even down from Limerick. My son and his wife, the three kids and Declan out from Galway. I started driving when I was 30, 32 or 33, in the Sixties. One evening Tom was spraying the front of the shop, as we called it, to kill the weeds and he said, “I want to go in and put on me overalls and try and do something with that car,” he said, “get it out of the way.” I sat into the car and I went. I went up the road and turned above at the cross. I never stopped after that. I had no lesson. No one brought me – no one put me behind the wheel. I went myself. I was out to drive.